I recently got the opportunity to try my first ever Cirque polishes, and I'm totally in the love. Not just with the polishes (which are glorious) but also with the attitude and professionalism of creator Annie Pham. I received such a delightful email from Annie which truly demonstrated to me her belief in her brand and polishes and I've never felt so valued and respected as a blogger. I have more polishes from the Alchemy Collection to share, but for today I've got a simple bit of nail art using Lichen and Ica Valley. Lichen is a golden olive that shifts to grassy green at different angles. In the sun it looks much more golden and in the shade it looks greener. In the bottle is shows off a crazy blue and purple colour shift at the corners, and whilst I wasn't able to see those colours on my nails it is still an totally stunning green with a vibrant shimmer. I paired it up with Ica Valley which I also absolutely love, but hey, it's a gold glitter so that shouldn't surprise any of you. 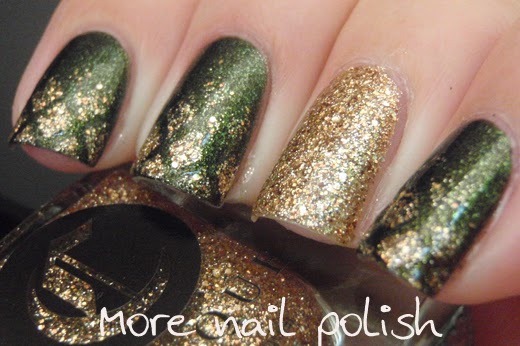 If I only had this polish a week earlier I would have found a place for it in my guess that gold collection. Ica Valley is a golden beige micro-glitter. The opacity is fantastic and you get full coverage in just two coats. 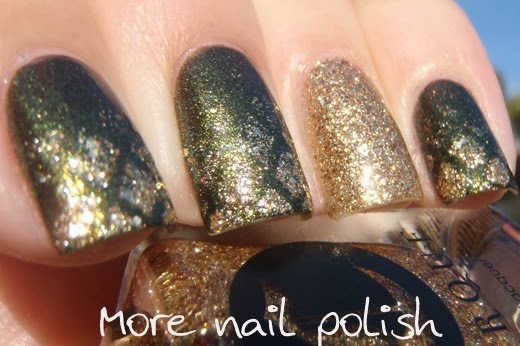 But even though it's packed full of glitter, it's not thick or difficult to apply. Instead it applies perfectly. I was also expecting it to be rather gritty, because it almost has the appearance of a textured polish. But it actually dries quite smooth and is glossy after only one layer of top coat. The colour of the gold is also a on the cooler side, which means it's not orange or brassy and would tend to suit more skin tones. These two colours just screamed at me to be worn together. Classic Green and Gold, I love it. The design was created with a little bit of striping tape, crossed over my tips and then the gold glitter dabbed on in a rough gradient.